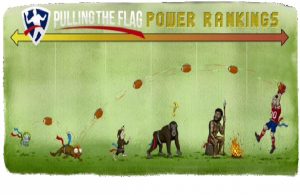 …And we are back with another section of the Playoffs Power Rankings! This time running through our #16 to #10, so what are we waiting for, lets get into it! Next we have the ever improving nice guys from Sheffield. In what saw them in the toughest MEC division having to face Giants and Honeybadgers twice they proved to be a force in the MEC finishing 10-4 on the year. QB Keith Woodley (66tds/9ints/11sacks) will look to hit Luke Bennett (24tds) and the ‘swaggiest man in flag over 40’ centre Mike Sullivan (14tds) and Tom Fowkes (14tds) all day long. Round 1 will see their defence try to slow GBs Bud McFerren with Craig Costello (8ints) Fowkes (7ints) and Jonas Robinson (6ints) to vanquish their round 1 playoff slump (0-3). 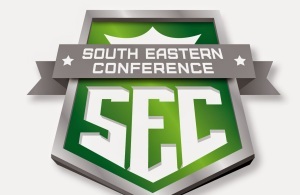 These guys just made the playoffs last season at 5-8 and improved to win the SEC north with year at 8-5-1. Spartans have had some hard fought matches this season and have to mix it up at QB between Harry Staszewski (31tds/10ints/2sacks) and GB speedster Jeff Bond (21tds/3ints/3sacks). Spartans will be hoping Staszewski will play under centre to allow the fast paced Bond to add to his (12tds) and relieve pressure from leading scorer Dan Benning (22tds). They will be looking to slow down the nippy Cougars in round one by matching speed for speed and will look toward Sean Martin (10ints) to add some extra magic for them. 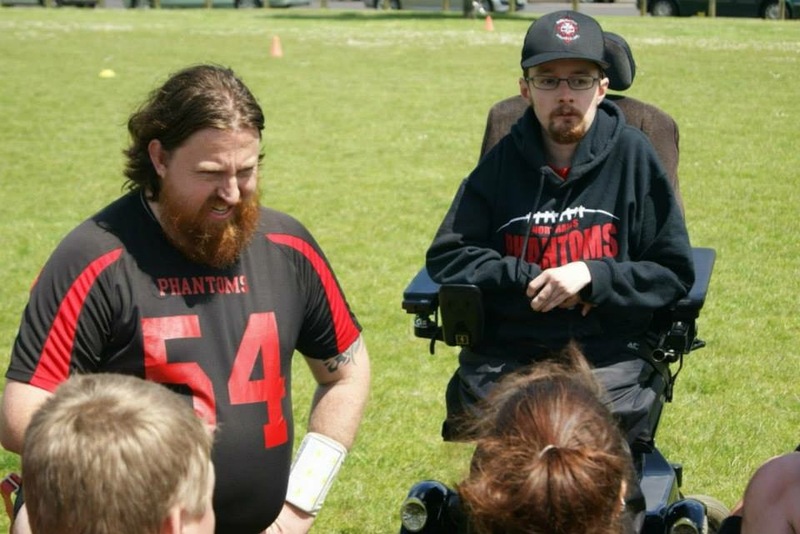 Whilst the SEC has plenty of talented teams the Phantoms found themselves in one of the easiest divisions taking second place at 11-4 with the two teams in third and forth both having a record of 1-14, the playoffs where inevitable for the Phantoms. But don’t let that fool you, last season had them in a much tougher division and they made the playoffs at 12-3-1. The unfortunate thing for them is they have to face last years champions the London Rebels in round 1, and with a point to prove, thats a team no one wants first round. This will be a huge task for QB Jeremy Smith (67tds/12ints/7sacks) as he looks to keep their chances high with WRs Stuart Tarry (29tds) and Luke Hoskin (27tds). Their defence (370PA) will have a lot on their hands trying to stop the Rebels and will hope to slow them down with Pete Blundell (8sacks) Amy Griffiths (5sacks) and Dani Waples (3sacks/4ints). A huge win against a depleted Buttonhookers should carry the Lions and their confidence into the playoffs, after a tough season. It is sort of confidence could really help them against Titans Blue in round 1. QB Nick Schippers (49tds/9ints/1sack) will be looking to utilise his WRs, especially Dominic Howard (17tds), to help test a stingy Titans Defence. It could be the defence that decides the games though, boasting the best D in the SEC (257PA, although it does include 3 forfeits) they will be looking at guys like Schippers, Howard and blitzer Russell Cameron (8sacks) to keep opposing teams out their endzone. The Sharks may have had a little luck on their side to win the SEC south, they lost a high scoring game against Reading Lions (52-45) but ultimately a couple wins by forfeit and the Lions losing 3 from forfeiting gave the Sharks the division! That being said this is a side that have a wealth of experience and rarely fail to impress on game days. Round 1 will see them up against Hereford Stampede, who have shown they can beat some of the best in the league (Cardiff Hurricanes). The Sharks will be looking at veterans QB Neil Henderson (58tds/10ints/5sacks) and C Gary Robinson (10tds) to guide them through the day, also there will be no doubt Neil will be hunting down his favourite target Corey Bedford (26tds) all day. Now while the offence has great talents their defence hasn’t been the most consistent this year, they have managed to rack up (13ints and 10sacks) but have allowed (374) points on defence, that’s with a couple forfeit wins, making them one of the most scored upon opponents in the SEC. These guys will need to step up big time in order to progress to the final rounds. Fourth year in the league and it’s about time these guys made the playoffs, an ever so slowly improving team took a huge leap this year by winning the MEC central at 10-4, they also got their first win over city rivals Manchester Crows in week 1. These guys have never been a bad team either, finishing 9-7 last season, they’ve just been stuck behind a few good teams. Round 1 will see them against Dunbeth Dragons and will be looking at Ian Allonby (10sacks) to slow down the Dragons offence and allow the Titans solid offence to win games. So now we jump into the top 10, the big contenders of the playoffs, we start with the SWC central division champions. These guys must be fairly confident going into the playoffs with only 3 losses, one being an agonising 4 point loss to the Birmingham Lions without starting QB Adam Grindrod (52tds/4ints/2sacks). Round 1 will see them against the (Buttonhooker killers) Reading Lions, which will be a tough match up, but the Titans have one of the best defences in the league (207PA), with playmakers such as Connor Melay who racked up an insane (24ints) Ben Roberts (8ints) Stefan Rowden (8ints) Dan Archibald (7ints) and get this…..Harry Brailey with an outstanding (37sacks), these guys will be hard to score against. Let’s just hope these guys don’t go into another billionth overtime this time round, huh? How are we doing so far? Let us know, with the Top 9 teams left, who do we see at one?